We've been hard at work polishing our app, making sure that it shines and works exactly as it should. 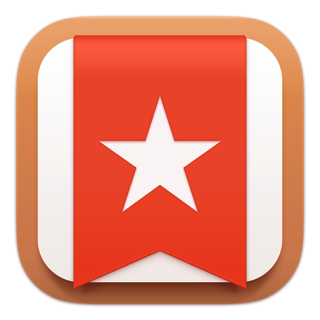 Wunderlist is a simple-to-use to-do list app that keeps us on track. Thanks to its recurring items and notifications, we never miss deadlines or forget to grab milk from the store. 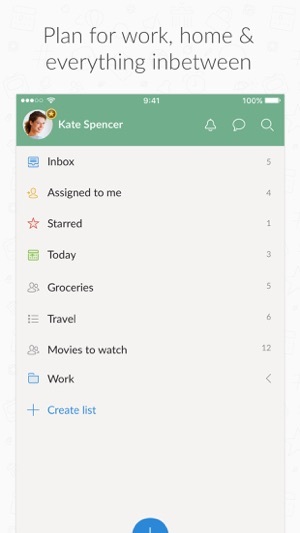 With collaborative lists that stay in sync across iPhone, iPad, and Mac, we can keep our baseball games, movie nights, and team meetings organized. Good (needs an update/suggestions) PLS READ! This is pretty much the simplest, cleanest app that doesn’t have TOO many options to use, making it handy bc most people don’t have time to sit and re-color words, highlight them, hand draw things in, etc. - especially on your phone! (I have the iPhone 8+). 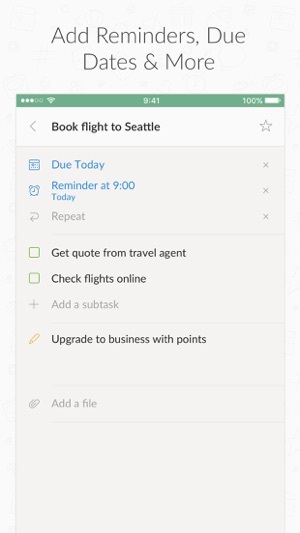 Lists like Evernote, for example, are just far too advanced/overwhelming and when I tried it, I found myself spending more time on setting up the notes and personalizing them and incorporating the WAY too many options, that I lose time in the end and it’s counterproductive to my productivity. That’s why I like this app. It’s perfect for a quick list maker, but you can still have some options. I highly suggest making the app just a little more updated - something newer and more fresh while still being simplistic. I think maybe even having the option as to which fonts you’d like to use, or just even color coding the lists would be more appealing for users. PLS HIGHLY CONSIDER THIS, as I’ve found myself happy with the app, yet I’m almost getting bored with it. Nothing has changed or even updated since I downloaded it about a year ago. That’s the downside - no happy medium b/w totally too many options vs virtually none. Hopefully this helps and I hope my suggestions are taken into consideration; I would hate to have to find a completely different app when this just needs a refresher/update! 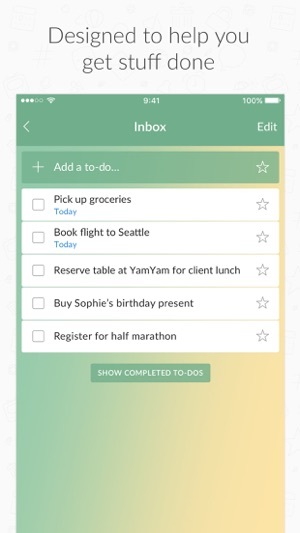 This app is the first to-do list app I've tried, and it's fine. It's obviously better than just making a list in my phone notes, but there are a couple of simple flaws that consistently bother me when I use it, which is often. First, an interface flaw: the app is extremely particular about where you have to tap in order to check off an item. 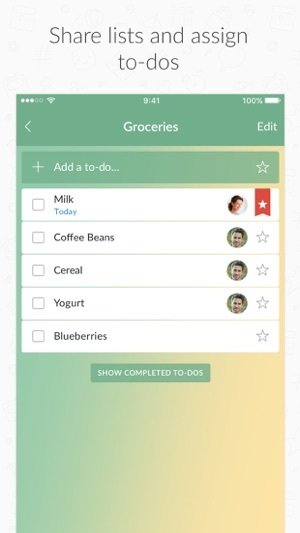 On the main list this is not so bad, but the issue comes when I am checking items off a subtask list- if I tap too far in the direction of the item name, nothing happens, but if I tap too far to the edge of the screen I am flung back to the parent list. 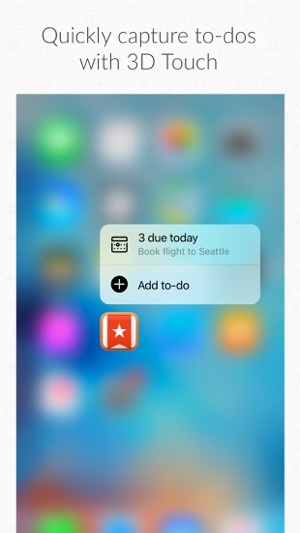 Intuitively, this function should only activate if I swipe right, not if I just tap too far to the left. It's a small thing, but I really use those sub-lists and it's a real pain to constantly have to be going back into the sub-list that I never intentionally left. Second, an easy feature that I'd like to see that maybe is available in a paid upgrade (I haven't checked): I use the same few lists repeatedly (e.g. a packing list), and once I have checked all items off a list, I have to manually and individually mark each item as incomplete in order to use the list again. It seems like there should be some kind of "mark all" feature. So maybe my needs are just really particular, but those two things would make this app pretty much perfect for me. Thanks, Wunderlist!